The Daily Caller reported robocalls are trying to mobilize black Democrats to support Cochran by tying McDaniel to the Tea Party and its opposition to President Obama. In the automated message appearing to target black Democrat voters in Mississippi, the female voice on the line claims that tea party challenger Chris McDaniel would lead to more obstruction in Washington and create more “disrespectful treatment” to the nation’s first African-American president. 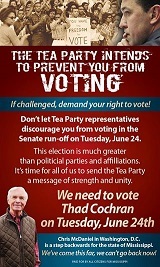 The left-wing media is jumping at the opportunity to slam the Tea Party and support Cochran by raising fears of intimidating black voters. In The New York Times editorial blog, “Scaring Away Black Voters in Mississippi,” Juliet Lapidos adds fuel to the race card fire by characterizing Tea Party poll watchers as a voter intimidation effort. The Senate Conservatives Fund, Freedom Works and the Tea Party Patriots, all political action committees, will “deploy observers in areas where Mr. Cochran is recruiting Democrats,” according to a Times article. Ken Cuccinelli, the president of the Senate Conservative Funds, said these observers would be trained to see “whether the law is being followed. The GOP establishment’s race card effort is reinforcing the negative image of the Tea Party and will do lasting damage to the reputation of Republicans within the black community. It’s absolutely disgusting that the GOP establishment would stoop as low as left-wing radicals to maintain power. They actually came out from behind the curtain and exposed themselves as the true RINOcrats that they are. The GOP establishment should be proud of itself. Hinds County is 69% black according to Wikipedia. Hinds County voted for Obama 72%-27% in 2012. In the primary election, Cochran won Hinds County 10,928 - 5,621. In the runoff, Cochran won Hinds County 17,169 - 6,497. Cochran won the runoff by his approximate vote improvement in Hinds County. Those in the GOP who oppose TEA Party activists are a little more humble when it's election time for themselves. It is ridiculous for this internal fued to get so ugly. Those who carry it beyond convention halls are doing an injustice to the cause. Primaries are for decisions, not divisions. And it's no small wonder that Sen. Thad Cochran is so 'scared' that he asked for Democrats to vote in Mississippi Republican Primary! No wonder the Liberal GOP is marching in lock step ... right behind him! Democracy and Power 102: Voters are Rationally Ignorant Harmfully, the vast majority of the voters are rationally ignorant of most of our government actions. The public is ignorant of bills, legislation, regulations and taxes that ultimately impact their lives.